Anyone who knows me, knows I’m a huge fan of George Clinton / Parliament / Funkadelic and also heavily influenced by them. (Maybe not musically, but definitely spiritually). 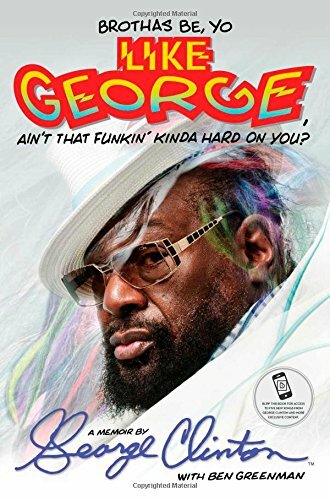 Because of that, I couldn’t wait to get my hands on George’s new auto-biography Brothas Be, Yo Like George, Ain’t That Funkin’ Kinda Hard on You?. The book is a self-told memoir starting back from George’s humble beginnings all the way up to present-day recording with Kendrick Lamar. I saw Dr. Funkenstein speak at the New York Public Library last week and decided to write a quick book review for all those interested. It won’t break the bank, so hit up Amazon and get it! If you love P-Funk, this book will fill in a lot of blanks. George tells several stories from behind the scenes which are for the most part hilarious. The book starts out with George moving to New Jersey and how he fell in love with music. He eventually finds himself in Detroit trying to start the next Temptations, but get’s rejected by Motown. The story follows his career to the height of the P Funk empire and moves on towards it’s demise in the early 80’s. Strung out on crack, it’s a dark time but is eventually gets brighter with the resurgence of P funk, spearheaded by young rap acts sampling his work. The book closes out with George’s recent legal battles trying to get his copyrights back and excerpts about his new recordings. Overall, the book is great but to a long time fan like me, there are still a bunch of missing pieces. They obviously didn’t want to make the book 1000 pages long, and it’s been so long George might not remember everything that happened to him. The editing isn’t the best either. The book tries to remain chronological, but sometimes things skip around. At times, the book can get really depressing especially during George’s crack addiction and time spent with Sly Stone. However, this shouldn’t stop you from checking it out. The stories from the 70’s are worth it alone. Also, the book helps to high-light George’s ongoing legal battles and how his copyrights were essentially stolen from him. And funk is it’s own reward.